How long does it usually take to go from conception of a game to the first playable prototype? We didn’t run the numbers, but the tendency seems to be months rather than weeks. When Bruno Faidutti and Serge Laget started creating Ad Astra, the time taken to produce a playable prototype (excuse the alliterations) was more like “a phone call and ten hours”. Given this astounding feat, it’s more than justified that Ad Astra was published in Nexus’ Designer Series, a series of games from the Italian publisher that puts a stronger focus on the game’s designers. When reading through the rules, you will likely recognize many elements from other games. There is a strong shot of Settlers of Catan – which Faidutti names as one of the inspirations for Ad Astra -, a bit of Robo Ralley, a shot of Puerto Rico, all set in a post-human science fiction world… but don’t be fooled into believing Ad Astra is just a re-theming of any of these. It combines all those elements into an entirely new and exciting experience. But lets start at the beginning. In the beginning was the table, and the table was empty and devoid of any kind of game board. The table will not remain empty for long, of course, but the lack of game boards will remain. Instead, you start out by creating the universe: you scatter the 9 stars across the table, with the dying sun in the center. Then you add planets to those stars, one for each player around the sun, any number of planets around all the others, and all the planets face down. Each player now picks a planet around the sun, turns it face up and puts one of his factories on it. The player colours represent one of the post-human species that inhabit the solar system in this distant future. This species, although lovingly depicted on the back of your deck of action cards, has no further influence on the game, there is no special abilities associated with it. However, we did not reach a consensus whether that is a missed opportunity or in fact a good thing for the game. While species-based special abilities might add a bit of flavour and more strategic options, it would be reasonable to say that Ad Astra doesn’t really need more of either, and that adding something like that would destroy the elegance and symmetry of the system. Anyway, the starting planet you draw determines which kind of resource you are able to produce at the beginning of the game. You will start with one of each kind of resources, so this does not determine your starting strategy as strongly as it sounds. You also start with one space ship already in deep space, giving you the chance to discover a new planet on the first turn and diversify your production. The available resources are: water, food, energy, xanthium ore, yoyodium ore and zozodium ore. The last two might make the game a pain to play online, given that switching between German and English keyboard layout effectively exchanges them. But don’t worry about this little fact too much, if you are anything like us, you will start calling the three ores pebbles, boulders and bricks, according to the image on their cards. Produce: each production card has not one but two resources printed on it, the owner choses which resource will be produced. All players then receive one card of that resource for each colony and space ship on a planet producing that resource, two for each factory. The fact that each production card has two types of resources has one important side effect that is easy and sometimes painful to forget: you can not produce those two resources in the same round. Move: each move card has, again, two symbols on it representing two of the stars in the game. The owner starts with moving one of his ships to either of those systems. 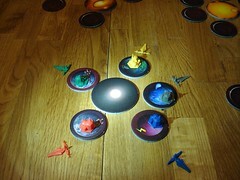 After that, the other players may each move on of their ships. Unlike with production cards, each player gets to chose their destination system herself. After all the other players moved, the owner of the card may move all his other ships. Moving a ship costs energy: one energy card to move from a planet into Deep Space (cue Star Trek Theme) or to another planet within the same system. Two energy take you to a planet in a different system. Moving from Deep Space – meaning somewhere on the table, outside of a system – to a planet costs no energy. When arriving in a system – or travelling inside on – you may look at all the planets in that system and then move your arriving vessel to one of them, turning it face up if it was previously hidden. You can never move to a planet that is already occupied by another player, if you want to start a war in space Cosmic Encounters is the way to go. Ad Astra is peaceful exploration. Just to make things a bit more fun, every player only has card to travel to six of the 8 systems, so to move to some systems, you have to rely on the other players to hitch a ride. Build: The owner of the build card may build as many new space-colonizameeple (did I mention we’re contractually obliged to call something “meeple” at least one in every review?) as he likes by paying the required resources. Each other player may then build one space-colonizameeple. You can only build colonies, factories or terraformings on a planet where you have already established a presence, so you always start the colony by arriving in a space ship (well…. duh?). Each of these gives you some immediate victory points. You can also build a space ship to speed up your exploration. New space ships start in Deep Space, so their first flight never costs energy. Trade: I’m guessing here that the designers, no matter how much they liked Settlers, were annoyed by how slow the trading can be if people just won’t tell what they have to offer. When a trade action comes up in Ad Astra, all players put their resource cards on the table. The owner of the card may then propose trades to any of the other players, or trade 2:1 with the intergalactic bank. Points: the victory point cards are the one big mechanic in the game that – to my knowledge – did not appear in any other games before, and that also has the biggest influence on your strategy. There is three victory point cards, each again with two options what will be made into points from which the owner of the card chooses one. Identical Resources or Different Resources: starting to the left of the cards owner, every player either pays as many identical resource cards as he wants, or as many cards of different resources as he wants, gaining one point for each in both cases. On all the cards, the player that gains the most victory points from them gains an additional three points. That’s why the going last on the resource card is an advantage for the card owner. After all the cards are face up and played out, everyone has to discard down to ten resources if they had more. Then you get back your action cards. But not all of them: you only get back your victory point cards after you played all three of them. There goes your strategy of specializing on building a big fleet and repeatedly scoring points for it. There is one last thing that we conveniently forgot to mention so far: some planets you discover have been stripped of all their resources already by our alien precursors. While this may seem quite painful when the big factories of Ursa Minor are hungry for resources, those planets make up for their lack of riches by hiding forgotten artifacts from Them-who-were-before-us. For unknown reasons, those wacky aliens used to label their inventions in Latin, but who are we to complain when they leave us useful toys? The alien artifacts vary widely in their effect on the game from giving you 2 resources from the Repositorum Alienum (Alien Storage) to allowing you to place an additional action card before the first or after the last card on the track with the Pertubation Temporis (Time Distorter). 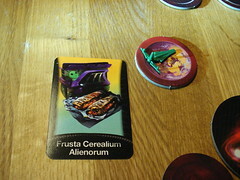 And then there still is the Frusta Cerealium Alienorum, but I’ll leave you to figure that one out. 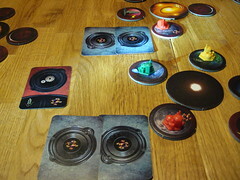 Two of the alien artifacts are in fact so powerful that players are advised to discuss before the game if they want to include them or not. One of them, the Magnum et Antiquum Arcanum awards you ten victory points after the game ends, the other, Omnibus Rebus Responsum, makes you win the game if you have exactly 42 victory points at the end. This little nod to Douglas Adams would award Ad Astra a place of honour on my game shelf all by itself, thank you Bruno and Serge for that. The game ends at the end of a run in which a player gains 50 or more victory points or the last planet is flipped over. This last one actually never happened to us, we always had many planets left unexplored by the time someone crosses the finishing line of points. The game components are all well-designed and nicely made. The molded plastic space-colonizameeple make the game look a bit like an American production – most European games still prefer wood – but they go very well with the setting and are also nice to look at. The manual is clear and concise and also contains the short synopsis of the professional vitae of Faidutti and Laget. Although lacking a game board, Ad Astra will require a bit of space to set up if you want to avoid the mysterious planets-traveling-to-other-systems phenomenon. To be honest, the first few games of Ad Astra I played, I kept thinking “this game is so unbalanced, I do everything right and I just can’t win”. It took me a while to realize my problem: I have played many, many games of Settlers of Catan in my life, and Ad Astra shares so many details with it that I was using the same strategies. But I was playing with people with much less of a Catan obsession in their past, they were actually thinking about what to do here. Long story short: Ad Astra is not a Catan game. It does not reward longtime planning as much, it does not give you points for having a balanced resource production. Ad Astra rewards you for producing a big burst of something – gathering a lot of pebbles, building two new factories, doing anything to put you in front of your competitors just for a short moment, and then throwing the right points card in there. Another thing is that the layout of your playing field is almost irrelevant. There is no way to lock someone out of important resources, and traveling to another system takes the same time and resources, no matter how far apart they seem to be. After understanding this strategic groundwork of the game, I found myself enjoying it a lot. There is little luck involved – barely any if you leave out the two big artifacts – victory is achieved by carefully deciding on your actions, a healthy dose of opportunism and some ability for predicting the others’ moves. Planning your own moves efficiently requires you to get into the other players head, figure out what their goal will be for this round. By remembering which of their point cards are out of the game for the moment, what resources they have and in what position they put their action cards you can usually make a pretty good guess what the action is going to be. Of course, they know that, and they try to do the same to you. This makes Ad Astra a very enjoyable psychological game, adding potential for bluffing your way to victory. The fact that you are involved in every action that is flipped up on the planning board makes the game have virtually no down time, so the 45 to 60 minutes you spend on a game will always be very involved, giving you many opportunities to make decisions, regret decisions, repeal decisions and generally have a good time.